She was married when she was one year old. She didn’t get a say, she didn’t even know how to speak. Her parents traded her like a piece of property, her life theirs to do with as they pleased. But Laxmi Sargara refused to go along with it. When, years later, her “husband” came to collect her, she told her parents she wasn’t going. This week, aged 18, she became the first Indian woman to refuse the marriage she was entered into as a child and demand that it be annulled. She should be hailed as a hero. It is estimated around 200,000 child marriages take place every year in India, though the numbers have been declining recently. That makes a rough estimate of 1.7 million Indian women who have married off as children since Ms Sargara’s “wedding”. And Ms Sargara is the first to say “No”. She shouldn’t have had to get an annulment. Child marriage is supposed to be illegal in India, but it goes on, every year, while the government shrugs and does nothing. Seven years ago, I travelled to a remote village in Madhya Pradesh where a festival of child marriages was taking place for The Independent. Hundreds of under-age couples were gathered in a field under brightly decorated tents. Their parents weren’t just breaking the law, they were holding a festival to celebrate the fact. They were celebrating marrying off their children as young as one. It was savagely hot. I’d booked the only hotel for miles around that had air conditioning, but when I got there they told me it was broken. The photographer said the only thing for it was to get drunk. The next morning, when we headed to the festival, I was hung over and felt sick from the heat. I wondered if the whole thing was a hallucination. There were little girls dressed up as brides, wearing make-up, with bright new rings through their noses. Everyone was having a great time, the children oblivious of what they were being consigned to. 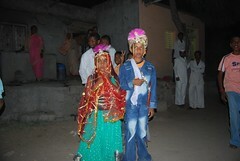 One 11-year-old girl was marrying a 20-year-old man. She seemed excited. Her younger sister was envious and jumping around, vying for attention. A couple of policemen were watching from the sidelines warily. “Why don’t you stop it?” I asked them. “What can we do against all of them?” one of them replied. “So have they.” He indicated the villagers. A few days before, an official from the Department of Women and Children’s Welfare was foolish enough to try to do her job. She went to the house of a family that was planning to marry off three under-age daughters, and demanded to see proof of their ages. That night, a young man came to the official’s house with a sword and cut one of her hands off. At the time I wrote about the child marriage festival, I was frustrating my editors, who wanted pieces concentrating on India shining, all shopping malls and booming economy, while I kept disappearing into the great hinterland of the country to report on cases like this. But I was fascinated by the two Indias, the bright new world of the cities, and the poverty and deprivation of the villages, and the way they co-existed. The government didn’t seem too bothered by the problem. When he was asked about the official who had her hand cut off, the Chief Minister of Madhya Pradesh at the time shrugged and said trying to stop child marriage was like trying to end alcoholism, impossible. It was the mentality of the two Indias: the villagers were backward, had always been like this, and it wasn’t the problem of the government, which was busy with the economic emergence of the cities. Ms Sargara was comparatively lucky. Unlike many other child brides, she wasn’t sent to live with her new “husband”s family, but went home with her parents until she was older. The first she knew she was “married” was when her “in-laws” came for her a few days ago. If she’d been forced to go and live with her “husband”s family as a child, she almost certainly wouldn’t have been able to do what she did. It would have been too late.